Today’s Zelda Fanart Spotlight is on Deviantart artist glitcher’s Majora’s Mask fanart, “They Came…“. 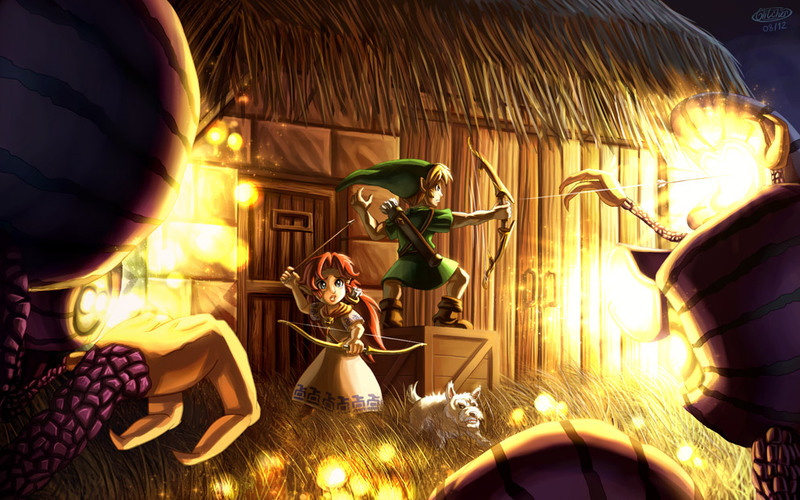 In this fanart it depicts the part of the game where Link helps Romani fend off the aliens that are attempting to get the cows in the barn. 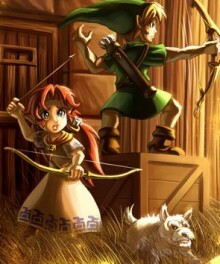 Link and Romani are bravely fighting against the aliens using their bow and arrows to help keep them at bay. Romani’s dog is helping the two by barking and growling at the aliens to try and scare them off. The fierce looks on the canine and Link’s face shows a determination to defeat these alien enemies no matter what. Romani possess a look of fear on her face when she sees that the aliens are nearing the barn and are getting closer to their goal of obtaining the cows for whatever reason they have in mind. Hopefully dawn is nearing soon. If this battle continues for any longer the three warriors might not make it and the cows as well as Romani Ranch will be the ones to pay the price. Please check out the artist’s gallery and let him know what you thought of his fanart. Also please let us know in the comments section below what you thought of it. Stay tuned for the next Zelda Fanart Spotlight! Until then!